We have done our best to provide answers below on questions that have been emailed to us. Please feel free to email us if you have further questions. 1 Is there such a thing as eternal sonship? 2 Did God leave Jesus Christ on the cross? 3 What is the meaning of "begotten"? Is there such a thing as eternal sonship? Please see our article on Eternal Sonship. Did God leave Jesus Christ on the cross? The Spirit left Him, in the garden of Gethsemane. He had to die, a man. Remember, friends, He didn't have to do that. That was God. God anointed that flesh, which was human flesh. And He didn't... If He'd have went up there, as God, He'd have never died that kind of death; can't kill God. But He didn't have to do it. But, remember, He went there with you in Him. See, God had never separated the Bride from the Groom, yet. So when God looked down upon the body of Christ, He saw both male and female. It was all redeemed in that one body. See? They are one, same, same Word. The same Word, spoke of the Groom, speaks of the Bride. However, it states in Romans 5:6 and 8, Romans 8:34, Romans 14:9 and 15, 1 Corinthians 8:11, 1 Corinthians 15:3 and 2 Corinthians 5:14 that CHRIST (the anointed one) died. He died as he had lived - as the Christ. William Branham's understanding of this issue was clearly non-scriptural. Read more about this in our study on John 18:6. Question:In John 3:16 the bible says: "For God so loved the world that He sent his only begotten Son, so that whosoever believe in him should not perish but have Everlasting Life." I guess my question is: Does a Spirit have a beginning? But Jesus, was begotten. That must have happened sometime, whenever. And if the begotten Son occurred sometime, isn't it reasonable to assume he had a beginning. If the Son was begotten does it not mean that in fact the Son had a beginning and therefore the Father had a beginning but God, the creator is Eternal? he that believeth not is condemned already, because he hath not believed in the name of the bonly begotten Son of God. In this was manifested the love of God toward us, because that God sent his only begotten Son into the world. The word "begotten" used in these passages is the Greek word "μονογενής" (monogenés) which means pertaining to what is unique in the sense of being the only one of the same kind or class. For example, in Hebrews 11:17 it states "he who had received the promises presented his only son" or "… was ready to offer his only son". Abraham, of course, did have another son, Ishmael, and later sons by Keturah, but Isaac was a unique son in that he was a son born as the result of certain promises made by God. Accordingly, he could be called a μονογενής son, since he was the only one of his kind. ...we have seen his glory, glory as of the only Son from the Father, full of grace and truth. We saw his glory—the glory of the one and only, full of grace and truth, who came from the Father. No one has ever seen God. The unique God, who is close to the Father’s side, has revealed him. ...but whoever does not believe is condemned already, because he has not believed in the name of the only Son of God. ...but whoever does not believe has already been condemned, because he has not believed in the name of God’s unique Son. Question: Why, in the Old Testament is the existence of a Son not even mentioned in the same context as is in the New Testament? The Old Testament is filled with types and shadows of the New Testament. Israel was God’s son in the Old Testament dispensation (“Israel is My son, My firstborn” Ex. 4:22), and the experience of Israel’s testing in the wilderness there anticipates and foreshadows the testing of Jesus as the Son of God in the wilderness in the New Testament dispensation. Isaiah has been called the evangelist of the Old Testament. This is due in part to the second half of Isaiah’s prophecy, which emphasizes salvation rather than judgment. But the primary reason Isaiah is called the evangelist of the Old Testament is that his book is filled with images and prophecies concerning the coming Savior. One of the clearest and most powerful of these prophecies is found in Isaiah 9:6 and 7. Daniel’s prediction concerning the Messiah is not the only place where His deity is affirmed. Psalm 2, recognized by ancient Jewish commentators as well as by Christians as a messianic psalm, speaks of the “nations” (v. 1) raging against “the Lord and… His Anointed” (v. 3). The Scriptures presenting the Messiah (the Christ) as the Anointed One clearly establish the fact that the Person who will come to deal with sin and establish His righteous rule is indeed God Himself. This name is associated with perhaps the most famous prophecy in the Bible. The prophet Isaiah declares, “the Lord Himself will give you a sign: Behold, the virgin shall conceive and bear a Son, and shall call His name Immanuel” (Is. 7:14). The promised child was not simply to be miraculously conceived, but also was given a name that in Hebrew means “God with us.” In fact, the way the name is constructed gives it a slightly different emphasis: “WITH US is God!” God is not just to be “with us”in the traditional sense, but is to be WITH US in a unique sense. The One who is to be born of a virgin is God, come to earth as a true human being! He is to be with us in our humanity, born into the world as an infant as we are, and yet at the same time fully God. A number of chapters in Isaiah are dedicated to the description of a person called the Lord’s Servant. It is clear from these passages, called “servant songs,” that God had chosen Israel to be His servant, charged with glorifying Him among the nations. But Israel failed in this mission. So Isaiah introduces God’s coming individual who will serve Him as a Servant and who will accomplish the mission God gives to Him. These scriptures include Isaiah 42:1–13; Isaiah 42:14–25; 43:1–28; Isaiah 49; Isaiah 50; Isaiah 52:13–53:12. Robert T. France has summarized the servanthood of Jesus, as revealed in Isaiah. The Servant was chosen by the Lord (42:1; 49:1) and endowed with the Spirit (42:1). He was taught by the Lord (50:4), and found his strength in him (49:2, 5). It was the Lord’s will that he should suffer (53:10); He was weak, unimpressive, and scorned by men (52:14; 53:1–3, 7–9); meek (42:2), gentle (42:3), and uncomplaining (50:6; 53:7). Despite his innocence (53:9), he was subjected to constant suffering (50:6; 53:3, 8–10), so as to be reduced to near despair (49:4). But his trust was in the Lord (49:4; 50:7–9); he obeyed him (50:4–5), and persevered (50:7) until he was victorious (42:4; 50:8, 9). The many chapters in Isaiah devoted to Jesus as God’s Servant make the title “Servant” one of the most significant of the names and titles of Jesus in the Old Testament. “Holy One” is one of the exalted titles of God Himself (p. 49). Yet the same title is given to the Messiah in Psalm 22:3 (NIV) and in Psalm 89:18. Perhaps the most striking application of this title to Christ is seen in Psalm 16:10 - For You will not leave my soul in Sheol, nor will You allow Your Holy One to see corruption. In the first recorded sermon in the Book of Acts, the apostle Peter quoted Psalm 16:10 as evidence that Christ’s resurrection was in full harmony with the Old Testament. The title “King of glory” occurs only in Psalm 24, a psalm that is clearly messianic. These distinctive titles of the Messiah are found in Isaiah and the Psalms. The title “sure foundation” is found in Isaiah 28:16. A parallel title, “the stone which the builders rejected,” comes from Psalm 118:22. Psalm 22:6 is the source of this title of the Messiah. It echoes the theme of Isaiah 53, namely, that people will reject the Messiah before He accomplishes His mission and opens the door for all to a saving relationship with God. Psalm 22 not only describes the Messiah in these painful terms, but also predicts the same words spoken to Jesus on the cross by enemies who ridiculed Him in His time of suffering (Matt. 27:39–44; Luke 23:35, 36). The Hebrew word rendered “seed” means “offspring” or “descendant.” This name or title is found in Genesis 3:15, which is the Bible’s first prophecy concerning the Messiah. The messianic title “a Star shall come out of Jacob” (Num. 24:17) was uttered by a pagan prophet, Balaam. Question: Do the words, Everlasting and Eternal have the same meaning? Answer:: There are two words which are translated as "everlasting" - ἀΐδιος (aidios)and αἰώνιος (aionios). "Eternal" is also a translation of these two words, as well as αἰών (aion). But then read the other, "But these shall go into eternal (That's a different. See? ), Eternal Life. Eternal comes from the word of eternity, and eternity had neither beginning nor end. It's forever and forever. Now, that should answer that (See? ), because if you'll just read the Scripture real close, you'll see. "And these shall go away into everlasting punishment, but the righteous..." The wicked shall go into everlasting punishment, be punished for a space of time: maybe a billion years, I don't know; but you'll certainly be punished for your sins. Now, hell, we'll go back to that awhile. I tell you that--that there cannot be... I do believe in a burning hell. Yes, sir, the Bible said so, the lake of fire. Now, but that cannot be an everla--it cannot be an eternal. It could be... The Bible never says it's eternal; it says everlasting hell. Don't say the word "eternal"; it says an everlasting hell. Now, it's prepared for the devil and his angels; an everlasting hell, not an eternal one. Now, after... That soul may be tormented there for its doing for ten million years, for all I know. I don't know what everlasting might be in God's sight. It might be for five minutes; it might be for a million years; it might be for ten million years; but there will come a time when that soul will cease to be. And these shall go away into everlasting (αἰώνιον) punishment: but the righteous into life eternal (αἰώνιον). The Greek word for everlasting and eternal in this verse is the same Greek word, which is why modern translation use the word "eternal" for both words in this verse. This is another clear case of william Branham's lazy or sloppy theology. Question: The concept of three "persons" in the Godhead leaves me with some more questions. God in three persons, blessed Trinity, the song says. But can a Spirit be a person? Why, when we read about the goings on in the Throne Room, there is always One sitting on the throne. Even in Revelation 5 there is One sitting on the throne and the Lamb in the midst of the throne. These questions may seem silly, but it bothers me sometimes. Answer: The Holy Spirit is a "he" not an "it". The Spirit is a he. "He" has to refer to a person. The Spirit is not an it, and the Spirit is not, therefore, a liquid, so you cannot say in a sense, “I want more of the Spirit,” and think in terms of gallons. You can’t say, “I have a gallon of the Spirit, and I need 10,” because if the Spirit is a person, then when we talk about being filled with the Spirit or having less or more of the Spirit, we have to think, what does it mean to have less or more of a person? You see, when a person comes into the house or out of the house, he’s either all the way in or he’s all the way out. I mean, he’s in or he’s out. The Father was with the Son. The Son was with the Father. The word "with" is very important. Later on in the chapter, down in verse 18 John brings it out a little further. He says the Son was in the bosom of the Father. Now let’s think about that. What is John saying? How many people are there in your life who have a right to your bosom. Put it this way. If you were lying on the rug, if you were lying on a couch, or lying in your bed, how many people are there, without asking permission, who could just walk up, stretch out next to you and lie up against your breast? How many people are there in life like that? For some of you there is no one. For some of us it’s just a very, very small number. So don’t you see, the posture of being in someone’s bosom means a personal relationship of incredible intimacy and centrality and primacy in somebody’s life. Then, keep this in mind. The Father and the Son had no bodies. They had no real breasts. So what does it mean when John says they were in one another’s bosom? The answer has to mean they were wrapped up in one another. Jesus says, “I and the Father are one.” We’re talking about spiritual unity, spiritual oneness. This is amazing. Many biblical scholars are sure that when John was writing that, he was thinking about … In the book of Proverbs, there is this very artistic and poetic place where it talks about God creating the world, and by his side was the divine wisdom. In Proverbs 8, wisdom speaks like this. It’s almost for sure that John was thinking about this when he penned these words. Augustine says if you’re a non-Trinitarian… Many people believe in God, but they’re non-Trinitarians. They say, “Well, there’s only one God, one Person. 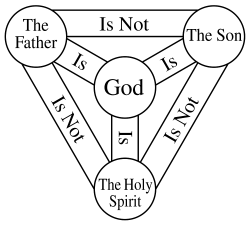 Jesus was a nice man, or Jesus was a kind of created being, but there’s only one Person, one God.” Augustine says if you are non-Trinitarian in your view of God, you have a defective God. You have a God who never loved anybody until he created the world. God existed from all eternity, but until he created at least angels, or until he created other human beings, other persons, he had never had a relationship. ↑ The Holy Bible: King James Version, Electronic Edition of the 1900 Authorized Version., Jn 1:14 (Bellingham, WA: Logos Research Systems, Inc., 2009). ↑ The Holy Bible: King James Version, Electronic Edition of the 1900 Authorized Version., Jn 1:18 (Bellingham, WA: Logos Research Systems, Inc., 2009). ↑ The Holy Bible: King James Version, Electronic Edition of the 1900 Authorized Version., Jn 3:18 (Bellingham, WA: Logos Research Systems, Inc., 2009). ↑ The Holy Bible: King James Version, Electronic Edition of the 1900 Authorized Version., 1 Jn 4:9 (Bellingham, WA: Logos Research Systems, Inc., 2009). ↑ Johannes P. Louw and Eugene Albert Nida, vol. 1, Greek-English Lexicon of the New Testament: Based on Semantic Domains, electronic ed. of the 2nd edition., 590 (New York: United Bible Societies, 1996). ↑ The Holy Bible: English Standard Version (Wheaton: Standard Bible Society, 2001), Jn 1:14. ↑ Biblical Studies Press, The NET Bible First Edition; Bible. English. NET Bible. ; The NET Bible, Jn 1:14 (Biblical Studies Press, 2006). ↑ The Holy Bible: English Standard Version (Wheaton: Standard Bible Society, 2001), Jn 1:18. ↑ International Standard Version, Jn 1:18 (Yorba Linda, CA: ISV Foundation, 2011). ↑ The Holy Bible: English Standard Version (Wheaton: Standard Bible Society, 2001), Jn 3:16. ↑ Biblical Studies Press, The NET Bible First Edition; Bible. English. NET Bible. ; The NET Bible (Biblical Studies Press, 2006), Jn 3:16. ↑ The Holy Bible: English Standard Version (Wheaton: Standard Bible Society, 2001), Jn 3:18. ↑ International Standard Version, Jn 3:18 (Yorba Linda, CA: ISV Foundation, 2011). ↑ Phil Roberts, "The Temptation of Jesus", in Jesus for a New Millennium: Studies in the Gospel of Matthew, ed. Ferrell Jenkins, Florida College Annual Lectures, 85 (Temple Terrace, FL: Florida College Bookstore, 2001). ↑ Larry Richards, Every Name of God in the Bible, Everything in the Bible series, 94 (Nashville, TN: Thomas Nelson, 2001). ↑ The Holy Bible: King James Version, Electronic Edition of the 1900 Authorized Version., Mt 25:46 (Bellingham, WA: Logos Research Systems, Inc., 2009). ↑ New American Standard Bible: 1995 Update, Mt 25:46 (LaHabra, CA: The Lockman Foundation, 1995). ↑ The Holy Bible: King James Version, Electronic Edition of the 1900 Authorized Version., Jn 16:13 (Bellingham, WA: Logos Research Systems, Inc., 2009). ↑ The Holy Bible: King James Version, Electronic Edition of the 1900 Authorized Version., Jn 1:1–2,18 (Bellingham, WA: Logos Research Systems, Inc., 2009). This page was last edited on 23 August 2015, at 03:21.